This is my first Blog ever and this was my first Blog post. It will help you understand a little bit about my Blogging Journey……. Today is Monday and I want to make it something special. Hope you will be a part of my journey. This is my first blog post and I’d like to tell you about myself and how this writing idea got started. About a year ago, I was living in Tennessee and struggling to survive the cold, dismal winters. Some of you are probably saying that winters in Tennessee are relatively mild compared to other parts of the country. That may be true for you; but you see, prior to moving to the Smoky Mountain area, I had lived most of my life in the Sunshine State of Florida. I was accustomed to a max of 3 days where temps might dip below freezing and snow and ice was a rare commodity. Offering 95% of the days being sun-filled in Florida (sometimes even when it was raining), the Smokies presented quite the opposite weather….lots of dark and gloomy days especially during the winter months. Perhaps, it was the weather, perhaps it was the lack of job satisfaction, perhaps the unsettled feeling that often plagued me, or maybe I was just a gypsy in another life and needed to move on to another quest. Whatever was the cause, when my son suggested moving West to California, it just seemed like the thing to do. “Chasing The Sun” became my theme and I packed up whatever would fit into my car and a small U-Haul trailer, loaded in my sweet dog, Tramp and we hit the road. I had driven less than 100 miles, when the reality of what I had just done hit like a jolt of lightning! Should I turn back, did I do the right thing, what if it doesn’t work out??? ?…..’Visions of question marks dancing in my head’…..all spinning around and questioning the core of my sanity!! As would prove to be the case, my physical being was stronger than my roller coaster mind. All the while my mind was interrogating my actions, my car continued to stay steady on course–headed West……I guess it was an interesting way to pass the time as before I knew it, I had crossed the state line of the great state of Tennessee and into Arkansas and soon Oklahoma. No turning back now….I had committed to my path and I started to have more visions of the Pacific Ocean than fields and farmlands of Tennessee. I have landed what I feel is the best job I ever had….and trust me, my resume is overflowing with job experience. At each previous place of employment, I gave my best and worked hard to succeed. Leaving each had many reasons….going to school, moving with family, company expansion, company downsizing, quest for more advancement or enjoyment. And for some reason, for many years, I would get easily bored with doing just one job and often had two or three at the same time. It is a social responsibility company that is making a difference….one Monday at a time. It’s not about a dramatic show of banners and protests and bandstand politics; but rather a quiet movement of individuals who care about others; and each have learned that ‘caring’ starts with one’s self. It’s about creating a culture of goodness that then becomes a way of life that makes you want to share the feeling with others. Sounds like something that might last for a short stint and then slowly fizzle out, right? Not in my World!! Once you experience the ‘heart’ of this movement, you are hooked forever. It starts with little things like caring for yourself by exercising or eating better or even drinking more water to be healthy. It’s about doing things that helps others, helps the environment and creates a feeling of gratefulness about each moment of your life and each of the individuals around you. And the best part for me…..Well, you see the Every Monday Matters team isn’t about a staff who creates things that they don’t believe or care about. We don’t look at failures…but rather strengths. We’re not too busy when a team member needs a helping hand. We aren’t afraid to share our ideas….no matter how, at the moment, they may seem ridiculous or minute. We are what we are creating among others…..individuals who want to make a difference–in our work, our community, among our team mates and in ourselves. We all are part of something bigger than ourselves and We All Feel that we matter. Our purpose is simple…..We want you to feel the same. We want you to feel You Matter too!! So….today is Monday. Want to join the journey? Today You can make a difference. What have you been wanting to do for some time; but just couldn’t seem to find the time to start it? Start small. Make it simple. Just Do it!! Maybe you need to finish a project at work. Or maybe you need to clean out a closet at home. Or maybe, you need to tackle doing your Taxes (awww! the dreaded beast). Perhaps, you have a school project to finish or even there is a room that needs a new coat of paint. Make it about moving forward to a better place. Make a list, step by step, of what it will take for you to accomplish your goal. Then, tackle the steps one by one. Give yourself a date to meet your end results. Put it on your calendar with the thought it will be a time to celebrate. Each time you mark off one of the steps, you need to give yourself a pat on the back and remind yourself that you’re doing a good job. We all need to have goals in our life; but we also need to remember to reward ourselves when we are able to ‘jump the hurdles’ to reach those goals. I’d love to hear what you have given yourself as a challenge. Feel free to share your goals here. Or maybe, you’ve run into a roadblock and would like suggestions to keep going. This space should be considered your community that supports you and makes you feel you are not alone and there is someone else here applauding your efforts and cheering you on. Maybe others will offer suggestions or encouragement that you need to keep moving forward. 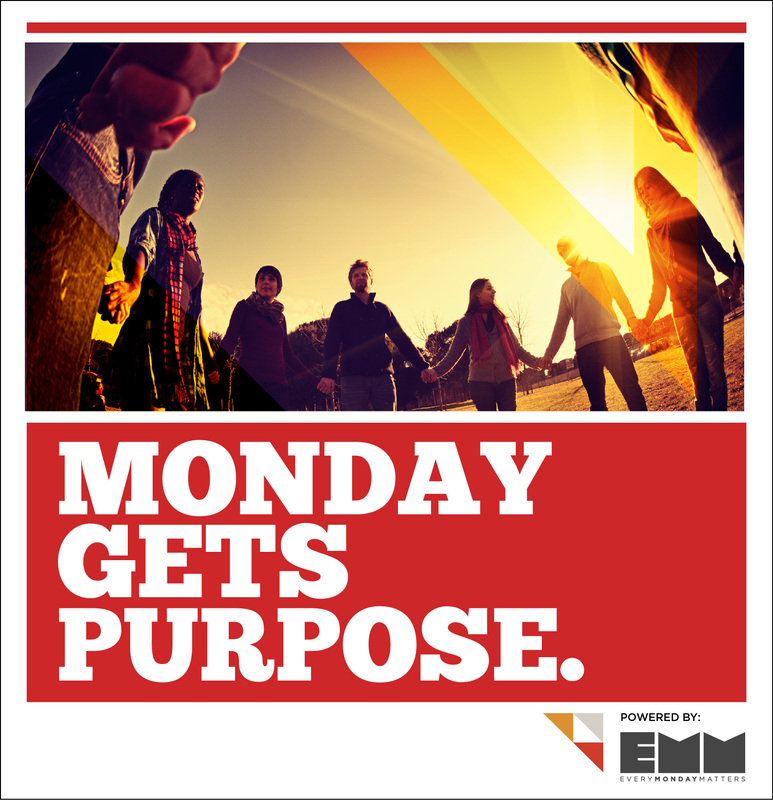 And remember…..once you give your Monday Purpose……you have become a part of the Every Monday Matters movement. You have just made a difference! Now, you’re part of thousands of others who have done the same thing. So pass this on……to one, to five, to ten other friends. Invite them to be a part of the Culture of Goodness that we’re creating……one individual at a time. We LOVE having you part of our team!! I love you more all the time, you know? The first I heard of “Monday” being the “start” of anything was as the ubiquitious day of (failed) dieting. The only real use I conciously know of is Moe’s Meatless Monday. I have no idea if this is in association with your Thing. Regardless, I love Moe’s and often eat there, and always vegetarian. I am an opportunistic vegetarian, or conscientious omnivore, or whatever the right term is nowadays (I respect the animals I kill for food). I’m getting off topic… I think it is amazing that you have a job where you get to encourage people to increase their awesomeness!! And you are so well suited to this very job! Honestly, I “found” you by reading your comments on other articles and being somewhat inspired even if it was not directed at me. I came to you NEEDING my “You Matter” fix. You have truly found your calling in life. You are awesome. I find it insanely fabulous that there is an entire industry/company/movement of encouraging people to increase their awesomeness. Everyone needs to increase their awesomeness. And you matter more than you know. I am in! Love the concept and your blog! I will be back for more inspiration. So proud of you! Wish we were there on THIS Monday! “Yes” I’ll go!! Monday or any other day.